ThermalSoft hot and cold compress are re-usable packs that provide both hot and cold therapy. ThermalSoft DuraPak" reusable hot/cold packs are 100% leak proof! ThermalSoft DuraPak" Hot and Cold Packs maintain an even temperature over the entire pad. The soft gel contents are leak-proof and contain no liquids or dyes. 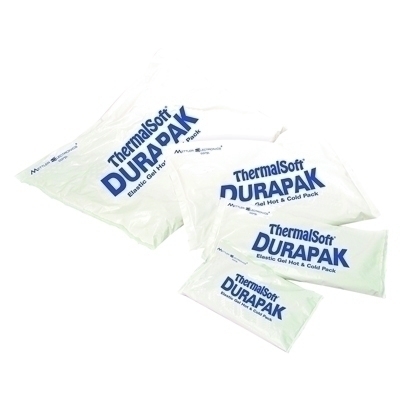 ThermalSoft DuraPak" hot and cold packs are biodegradable and non-caustic. ThermalSoft DuraPak" Hot and Cold Packs keep their pad like shape even at high temperatures and will not liquefy when heated. When used for cold therapy, ThermalSoft DuraPak" Hot and Cold Packs stay flexible when frozen. They bend to fit around treatment areas and maintain their thickness no matter how severe the bend. Dimensions: 5" x 1" x 10"